A subfield of computer science, artificial intelligence (AI) develops computers that can do things traditionally done by people. Its solutions can sense or perceive the world and collect data; understand the information collection; and act independently – all underpinned by the ability to learn and adapt over time. Augmented reality, virtual reality, natural language question answering, machine learning, autonomous vehicles – artificial intelligence powers most of the innovations that dominate today’s conversations about the industries of tomorrow. As of 2015, the transport and automotive sector held the greatest share of an AI market that Markets and Markets predicts will grow to $5.05 billion by 2020.⁵ In that period, AI is set to grow fastest in healthcare, where it can make treatments more efficient, and improve diagnosis, patient care and drug discovery. Retail, professional services, and oil and gas are among other important sectors. Around the world, road traffic accidents kill 1.25 million people a year, injure 20 million to 50 million, cost $518 billion and are predicted to be the fifth leading cause of death by 2030. Crash-avoidance technology in assisted-driving vehicles is already lowering accident rates. When AI-driven autonomous cars reach critical mass, those rates are likely to plummet. The insurance aspects of this transformation are not fully clear. What is clear, however, is that a liability shift will take place. Instead of driver behaviour, coverage will be placed on a car’s manufacturer, the software designer, device maker, map producer, the company that made the sensors in the highway or the vehicle, the operator, the passenger or the vehicle’s owner. Already using it behind the scenes for supply-chain cost optimization, retailers are set to deploy AI on the customer-facing front line, where its deeper understanding of consumer behaviour can increase revenues. In physical retail stores, AI-enabled digital assistants will seamlessly and automatically find, order and deliver the ideal option to customers, and thus help satisfy the growing consumer expectation of instant gratification. In Japan, Nescafe deployed 1,000 Pepper robots to retail appliance stores to help consumers pick out Nespresso coffee machines. Japanese telco SoftBank also experimented with Pepper earlier this year, opening a pop-up mobile phone store run entirely by robot sales clerks that speak 19 languages, recognize facial expressions and learn from conversations. It plans to continue testing the robots and deploy them across Tokyo to serve foreign visitors to the 2020 Olympic Games. The volume of data produced by healthcare organizations has increased tremendously. Driving this increase has been developments such as the digitization of clinical information through the implementation of electronic medical records (EMRs), the generation of significant amounts of real-time data by billions of connected devices,¹⁰ and lower-cost access to genomic information – not to mention the wealth of information captured on the internet. This information is feeding next-generation analytics technologies such as big data, cognitive computing and machine learning to, for example, improve the delivery of cancer treatments, personalize medical interventions, predict chronic diseases and drive behavioural change. Medical images make up at least 90% of all medical data, according to IBM researchers. Aiming to help clinicians extract insights from imaging data, the computing giant’s Watson Health and Merge Healthcare arms recently partnered with the Radiological Society to demonstrate some AI-driven solutions. Watson Health has developed cognitive tools for peer review, data summarization and physician support, as well as the MedyMatch Brain Bleed application, designed to help emergency-room physicians diagnose stroke or brain bleed by identifying relevant evidence in patient records. Merge’s Marktation augments the work of physicians by raising image-reading speeds and accuracy. It also has a cloud application for eliminating common causes of errors in medical imaging, and a Lesion Segmentation and Tracking Module. There is an unprecedented opportunity to harness the power of artificial intelligence to augment humans’ abilities to ‘do’, ‘think’, ‘learn’ and ‘feel’. By automating routine tasks, AI frees humans to focus on solving higher-order problems. In this way, digital innovations are improving workplace productivity (expected to rise by 22% by 2020)¹² and reducing the labour needed to complete a job (by 4% a year to 2019 in consulting)¹³. Accenture’s work with the World Economic Forum on the Digital Transformation Initiative has uncovered a variety of possible societal impacts stemming from the adoption of AI by different industries. Integrating predictive intelligence technologies into the design of smart cities promises to improve public safety.¹⁵ Singapore has already deployed sensors and cameras to monitor public spaces, but its Smart Nation programme has also raised concerns about Big Brother-style mass surveillance. 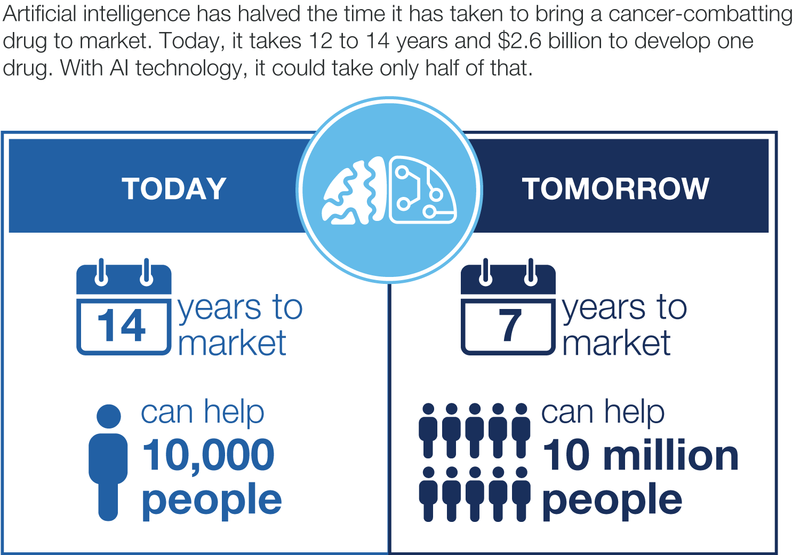 In healthcare, AI is helping reduce the time it takes to bring new drugs to market. Unemployment. As machines take over more mundane tasks, how do we prepare displaced humans to fill the roles created by new technologies? Inequality. How should the wealth created by machines be distributed? Humanity. How do interactions with machines affect our behaviour? Singularity. How do we maintain control over complex, intelligent systems? AI has the potential to drive significant productivity increases that improve the quality of lives around the world, but its development and use is not without risk. As such, it must be implemented responsibly. In 2016, Facebook, Amazon, Alphabet, IBM and Microsoft launched a partnership to research and promote best practices around AI. This partnership can be viewed as an example of self-regulation and is intended to provide a formal structure of communication. All the parties have made a strong commitment to keep the public informed about the latest developments in AI research. They also plan to expand the partnership by including non-profit organizations, ethicists and activists, and, in this way, accommodate diverse sources of expertise. 1 Accenture, Technology Vision: People First: The Primacy of People in a Digital Age, 2016. 3 Press, Gil, “Artificial intelligence rapidly adopted by enterprises, survey says”, Forbes, 20 July 2016. 15 World Economic Forum and Accenture, Digital Transformation of Industries: Aviation, travel and tourism, 2017.